CONICET researchers study how the DNA is modified in the first moments of life through the interaction with the environment. Chicken embryo. Photo: courtesy researchers. Pablo Hernán Strobl-Mazzulla, CONICET associate researcher, leads the Developmental Biology Laboratory at the Biotechnology Research Institute – Chascomús Institute of Technology (IIB-INTECH, CONICET-UNSAM). This place is dedicated to the study of epigenetic mechanisms that act in early stages of the development of vertebrates using chicken embryos as experimental models. “Understanding how epigenetics works on the normal development during the cell specification and differentiation has major implications for preventing a large number of disorders caused by the anomalous establishment and transmission of that information during the beginning of life”, Strobl-Mazzulla states. The name was coined by Conrad Weddington in 1942 but it has become relevant in the last few years. Currently it is defined as the study of the modifications in gene expression that do not alter DNA sequence and are hereditary. Nevertheless, nowadays the concept is used in a broader sense and it does not always imply the heritability of the changes. Actually, this branch of biology shows that genes do not determine what we are in a direct and irreversible way, bur rather demonstrate the great influence of the environment on our destine, to a certain extent. In recent years, different investigations have proved that genetic inheritance is not a process governed by predetermined programmes that pass from one generation to the next one. However, the on-off switch of genes is strongly influenced by experiences –on our own or our parents’ -, the food we eat and the context or environment we grew up. What do you study at the Developmental Biology Laboratory? 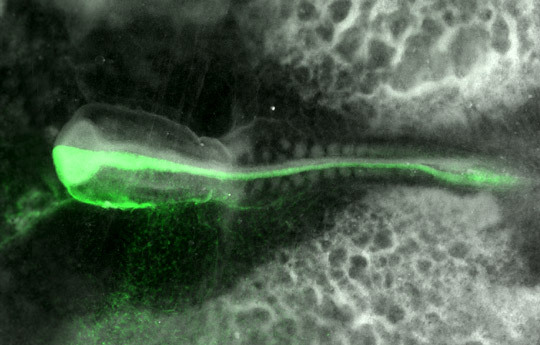 Currently, we have different lines of research devoted to understand epigenetic mechanisms involved in the specification and cell differentiation in tissue such as the central nervous system, neural crest cells and its derivatives (craniofacial bones and nodes of the peripheral nervous system, among others) and the development of the inner ear. Understanding the epigenetic mechanisms involved in the normal development of these tissues will allow us to learn about the mistakes that could lead the loss of the differentiation state of these cells and the consequential normal development. We use chicken embryos as study models because they have a number of advantages. First, there are several tools at the molecular level – their genome is almost completely sequenced -, as well as embryological ones that enable the handling of the different stages of development. Besides, the embryos can be developed and maintained at a very low cost and without the need to have major infrastructure. The ability of manipulating the embryos and the genes could be performed easily and quickly because the embryos develop outside the mother. What do you mean by ‘the on-off switch of genes? A simple way to understand epigenetics is to think how our cells form and differentiate. Human life begins with the union of the human egg and the sperm thus forming a unique cell with a genome made up of DNA from the father and the mother. In a few hours, this unique cell begins to split repeatedly. In spite of the fact that all the cells of our body have the same genetic information, they are developed in a different way so as to form the approximately 250 cell types that compose our body and they all have highly specialized roles. These differences are due to the existence of an ‘epigenetic code’ that is established early in the development, which is susceptible to environmental influences and determines which genes should be switched on and which ones switched off to differentiate cell type and establish its functional differences. How and where is the ‘epigenetic code’ established? The DNA of the nucleus of the eukaryotic cells is not naked but rather associated with proteins, for example histones, that compact DNA and form what is known as chromatin (DNA + proteins). Whether chromatin structure is more ‘open’ or ‘close’ determines the accessibility of diverse factors that regulate DNA, thus affecting gene expression. There is a great number of proteins that ‘write’, ‘delete’ and ‘read’ that epigenetic code. This demonstrates the reversible and dynamic capacity of that code in response to the influences of the environment over gene regulation. How does epigenetics affect embryonic development, adulthood and the future generations? During the first stages of life occur several epigenetic modifications which are necessary for the normal development of the vertebrates, including humans. In the last years these epigenetic modifications have proven to be easily influenced by unfavorable environmental factors such as stress, famine, traumatic experience, among others, and in some cases those changes have been inherited by subsequent generations. How does the environment influence these variations? In 2004, Nature Neuroscience published one of the studies that made a break in the way the environment could produce epigenetic changes that alter gene expression and behaviour. This investigation proved that the pups of the mothers that did not provide parental care, once they were adults they showed less tolerance to stress. This less tolerance was due to epigenetic alterations in neurons involved in response to stress. Interestingly, these epigenetic modifications could be either inherited by the following generation or reverted either thanks to drug treatment or by restoring parental care of those pups with other mothers. This was the first evidence that proved that psychosocial environment we are exposed to during the early stages of development have a significant impact on the physiological and behavioral response of the adult. Epigenetics would be a sort of long term memory, an interlocutor between the environment and the genes. Are there evidences of these epigenetic modifications in humans? These studies were also extrapolated to humans, where it was demonstrated that mothers who underwent traumatic experiences during pregnancy or children who suffered abuses or traumatic events in their childhood also had abnormal DNA methylation patterns. This maelstrom of studies has related this abnormal establishment of epigenetic marks to tolerance to stress, autism, schizophrenia and cancer, among others. For this reason large multinational laboratories are developing drugs to modify chromatin, that is to say, to manipulate epigenetic information. In general, deciphering the epigenetic code and learning to manipulate it could provide epigenetic therapies and boost medicine in this area. Pablo Hernán Strobl-Mazzulla holds a PhD in Biological Sciences of the Faculty of Exact and Natural Sciences of the University of Buenos Aires and a doctorate in Molecular Biology and Biotechnology of the University of San Martin (UNSAM). He obtained his Postdoct position in Caltech (Pasadena, EEUU). Currently, he is a CONICET associate researcher and since 2012 he has led the Developmental Biology Laboratory Group at the IIB-INTECH in Chascomús (CONICET- UNSAM). Besides, he has worked as an associate professor of the chair of Biología Molecular de la Ingeniería en Agrobiotecnología of the UNSAM since 2013. By María Inés Pietrantuono. IIB-INTECH.